I like to know too! My apartment seems to ATTRACT unwelcome person(s)!! I have done shielding & other *workings* & still its like my apartment is like a *honeycomb* to a bunched of *unwanted bees*!! My apartment unit is inside an old house sistuated down a hall away from the other units (you have to make an effort to get to it as its away from the other units). When there is a vacancy of the other apartment units, people will go to mine & tried to get in!! I've caught them several times & asking WHY would you tried to get into an occuplied unit (my door is decorated with a wreath, the other units' doors are not decorated, only having them to nervously laugh it off & saying they thought my appartment unit was the one vacant!! I WANT some might HOT MOJO to keep these snoops out! P.S. Sorry for all the exclamination marks & bold words, but this is very irritating!!!! Any suggestion(s) would be much helpful. The city I live in almost always makes the news for negative reasons - the crime & homicide rate, although there are plenty of other issues related to population segments lacking access to basic resources. The collective energy here has a thick layer of grief & transgenerational family & community related trauma. Even though I reside on the better side of town, the dark energy is still easy to pick up (and for me absorb like a sponge). I also live in an apartment complex, where most of my neighbors are great people. However, once in a while disruptive tenants do move in. One of my favorite all time herbs I use to keep my home harmonious, and cleared of darker energy, and unwanted visitors is Rue. Although I buy the stick incense through another source, LM sells the herb, which I believe you can make into a tea and sprinkle around the inside/outside of your home. It's really good for protection & neutralizing any negative influence: http://www.herb-magic.com/rue.html. Van Van is another herb that I swear by: http://www.luckymojo.com/vanvan.html. Anytime I come home to hearing disruptive noises by neighbors (arguing, slamming doors, energetic fields of anger, etc.) I burn a Van Van incense (stick incense not sold by LM) dipped in Van Van oil, and everything suddenly begins to quiet down & become peaceful ... it's pretty amazing how the energy transmutes so quickly!! 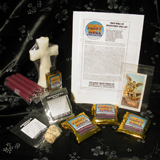 LM is such an amazing and informative site that they have a list of protection herbs, oils, and spells for you to read about and find something to your liking: http://www.luckymojo.com/protectionspells.html. A lot of people find Devil's Shoestring effective - I ordered it, but have yet to work w/this herb on it's own. Fiery Wall of Protection is also a great oil/incense to have in handy to help protect your home. Lastly if you choose to create a protection altar, the LM family also sells St. Michael candles ... he is also a very powerful protector. hey, i have a roommate but he stays at his girlfriend's most the time. I love that! Lately he's been home more AND he just informed me his friend, whom i dont want around, is going to stay over. for reasons, i wont go into, i cant immediately move out or tell him no. what should i do to keep both him and his friend from staying here for the time being. Hot footing sounds intimidating - as if i might be hurting others - or myself if i dont do it right. what can you suggest? Another idea, when the "undesirable person comes around", throw salt and pepper at their feet as they leave your home so that they will not return. Good luck and take care and have confidence in all of "your work"
***edited... somehow i missed the post, they (you had two posts back to back not in the home on the carpet) ... its out the door... ok*** ... and that is why they are called "sneaky tricks". You are not going to carry a whole bottle of Mortons salt in one hand and a pepper shaker in the other. Now if your issues run deeper and you like, love or have feelings for your roomate have a reading with a member of AIRR. If you and your roomate are in a platonic relationship, then the preceeding advice should help. Just remember to have confidence in what you are doing with your intent, ok. I agree Joseph that was a great recommendation cabriellenil! You can also work with banishing products instead of hot foot, that is a gentler version to move someone out. The salt and pepper has not helped. neither has the freezing approach. The roommate's friend, (we'll call him X) made his stay here permanent. Perhaps part of the problem is that i cant actually catch X while he is leaving. I throw stuff on the doorstep a few seconds after he walks away. He touches it on his way in or i touch it on my way out. Y is more likely to turn against me instead of X bc i complain. X just gets high. Sometimes Y joins him. i am scared. i am gathering money for a new apartment. Have you expressed your concerns and fears with your roommate? Maybe roommate doesn't realize friend is being such a nuisance. And if push comes to shove I'm sure a landlord would rather have a paying renter than a freeloading junky staying in their property, especially if you remind him that he will have a hard time finding a good paying renter to replace you if the house is becoming a drug den. On the other hand if the roommate is cool with drugs and parties maybe this isn't a good place for you to live period. In the meantime protect protect protect!!! Salt around your part of the house to protect, pray, use any protection supplies you have on hand to protect yourself and your property. i AM looking for another place. meanwhile, what are common "protect, protect protect!!!" supplies that i might have around the house and how do you deploy them? Salt would be the #1 most common protective magical supply. You can sprinkle it around and keep a small pouch full in your room and in your pocket. Do you have a lot of kitchen herbs? Are you good at identifying plants? Do you live in the US? Have the shop set some fiery wall of protection candles for you if you don't feel safe enough to burn candles in your home. Bay, basil, rosemary, garlic and sage are all common European kitchen herbs that are very protective. I also like blackberry for protection and it grows like a weed all over the US, even in the most dense urban environments. If you live in an area with cactus the thorns can be used as a more aggressive kind of protection. The herbs you can burn like incense or a smudge or you can also make a bag and carry the bag with you or put it in your room. If you have large pieces or branches of any of the plants you can put them above your door or under a rug. sooo...neither of my roommates has moved out completely, but they are spending time away. One of them left his pets though. How do i get him to take them with him? how do i make the point that he is neglecting his animals and that he should take them with him? he's not homeless. he has space for them. i have LM compelling oil? can that be used in a spell where you want to keep people at a distance and make them do what you want? I need a good. Protection. Spell or something I can put on my loved ones to keep us safe... any ideas,? I would use the Fiery Wall of Protection spell kit, and then dress family members with the oil, and use the bath crystals in the laundry rinse water, so their clothing is all dressed as well. I'm wanting to do some work to both keep away the prying eyes of my college's RAs and Campus Police, while simultaneously working to get rid of annoying visitors and unwelcome guests. I'm waiting on an order from lucky mojo, but would really like suggestions as to what work I could do in the meantime. There are two people in particular who visit my suite semi-regularly that I do not want coming over. I want them to feel unwelcome and uncomfortable. I'm looking especially for bottle spells I could use. Law Keep Away is perfect for your situation. Not only keeps police, etc. away, but any busybodies or people who want to interfere in your private business. Thanks guys, I will add brown candles and law keep away supplies to my next order. I didn't think about those also working against nosy, unwelcome people. I went out to a craft store earlier and bought a glass bottle with a cork. I put in some graveyard dirt, needles, broken glass, red pepper, salt, garlic, devils shoe strings, vandal root, and Spanish moss. I cut a petition paper out of a brown paper bag with scissors, wrote the names of those I didn't want over, and crossed their names with "KEEP AWAY". I dressed a candle with vinegar and red pepper and then burnt it on a plate with the petition paper underneath, saying Psalm 68. When the candle finished burning, I but the petition paper in the bottle, filled it with vinegar, and shook it. I'm going to to bury the candle wax at a crossroads in the morning. There have been over a dozen fires in my town this summer. The fire officials have determined that some of them are deliberately set, so I'd like to do something to keep the arsonist off our property! I noticed the protection scrub on the Red Brick Dust packet suggests using the name of the Chief of Police, so I thought of using that and substituting/adding the name of the Fire Chief. Is there anything else I might do specifically directed against house fires? (I have pets, so it's a big concern for me!) I plan to do some more general protection of the home stuff as well. Thanks - this forum is such a great resource! That's a fine substitution, beachglass -- or use BOTH names! Another form of protection is the warning system that employs copper pennies, and a third idea is to drive Devil's Shoe Sting Roots into the ground around the property. Do you mean the penny spell described here: http://www.luckymojo.com/lawkeepaway.html (presumably dressing them with a protection oil rather than Law Keep Away)? I was tempted to suggest Hot Footing the arsonist out of town (the irony would be delicious >:) but then he might flee before he was caught. Thanks for this! I'll have to give the name-boiling a try. This guy needs to be arrested before someone gets hurt or worse. Hello, I want to get some feedback about a little spell that I did to prevent a friend from inviting a specific person to their house. I took my friend’s picture, wrote words “You will not invite (person’s name) to your house at the party tomorrow). Then I folded the picture, tied it with a black string, tied three knots while saying “As it harms none and is for the best of all I mote it be” and then melted a black candle on top of the string. Then I put this in the back of my freezer with the intent to freeze my friend from inviting that woman. This was done specifically for an event tomorrow (New Year’s Eve) where the two of them will meet. I am wondering if you think it will work this fast or if there is anything else that I can do to make it more potent. Sounds like a good spell although the petition doesn't sound like Hoodoo! I have no idea if this spell will work immediately. Sassafras here with a question that's been on my mind for some time. I've read a few books on Hoodoo including Cat's book on Hoodoo Herb Magick etc..
My thinking was that Urine could be used in Protection spells such as Warding a relationship against rivals & enemies as well as warding a home with small amounts of Urine to keep things out. Would really appreciate anyone's thoughts on this as I've seen very little on the subject of Urine usage. Since you have my book on Hoodoo Herb and Root Magic, let me first direct you to page 154; there you will find a mini-index to entries that concern the use of urine. There are notes directing you to 24 different urine spells there, in addition to the urine spells already noted in the section on personal concerns. Now let me explain something about how domestic folk magic works. You do not start with an ingredient and say, Hey, i like this ingredient and i want to see if i can use it for this-and-so purpose. That's not folk-magic. That's making stuff up. It may work and it may not work, but it is not folk magic. Why not? Because folk magic is based in community experience. It arises from a culture, a region, a tribe, a group of people. It is not highly individualistic; rather it is shared wisdom, collective knowledge, and common practice. So when you come here and say you want us to verify your interest in using urine for "warding," the first thing i think is that "warding is not a term of art found in hoodoo." In other words, i think you want some spell that comes out of Neo-Pagan magic. "Warding" is not on the program. But you can use a hoodoo spell to protect your marriage and home -- and we can get you one. The second thing i think is, you think that i have written "very little on the subject of Urine usage"??? Huh? I have written about urine in hoodoo at length. I could write more, but i would only do so based on known folk magic traditions. So ... moving from the list on page 154, since i happen to know that Red Brick Dust is used for protection, let's go to page 165 in HHRM, the Red Brick Dust page -- and, voila! there's a very good hoodoo protective urine wash that involved a sprinkling of red brick dust. Note that this is NOT just urine, but urine and red brick dust. What do we know about hoodoo spells to protect a home against unwanted people? Well, on page 210 of HHRM, you will see lists of protection spell herbs, minerals, and zoological curios. Look in the second column, and that's where you will find that herbs and minerals like Salt, Pepper, Broom, Barberry, and Vandal Root (among others) come up in the two lists that involve getting people out of your space (one is for unwanted visitors, the other for actual enemies). So there you have the basic idea for a trick to protect a home and a marriage that involves urine and that accords with the tradition of hoodoo and is not just some sort of freelanced idea for which you seek our approval. I'd say that urine plus Salt, Black Pepper, and Red Brick dust would suit your purposes. Mix the three dry ingredients. If the interloper was a known and declared enemy, you could add Vandal Root. In either case, use the urine in a wash, as described on page 165, and follow by sprinkling down the three or four mixed dry ingredients in a line around the home, in order to protect both the place and the marriage. I'm terribly sorry for offending you . That was NOT my intention at all. I'm printing this page now so as to be certain I don't miss anything. My nephew wanted to move back to our hometown so I offered to let him stay with me while he looked for a job, new place etc. It has been about 6 weeks and he lays on the couch all day. I told him no drinking but he sneaks and does it anyways then gets really loud and stays up until 4 am. Worst of all, he acts inappropriately around my minor son, putting on movies that I have said I dont want him seeing and talking about things that you dont talk about in front of a 12 year old. We are only six years apart and have always been close so he figures he can just do what he wants and so far, he can. I told him to leave and he said no. I don't want to cause him harm, I just want him gone. I am working from home, single-parenting, going through a divorce and selling my house and I can't take the stress and am disgusted seeing him do nothing to get things moving while I constantly run around like my hair is on fire! Sorry to hear about your situation, unruly houseguests are never fun. Banishing products are a milder form of "hot foot" powders and unlike "hot footing" products will not leave them tangled up and leaving in a mess. It simply gives them a spiritual "Get Out". Afterwards i'd follow up with some cleansing, like chinese wash. If you feel bad and want to make sure he's at least able to financially support himself once he leaves, a walthy way candle lit in his name will make sure he at least doesnt fall flat once he leaves. Finish it all off with some peace water or peaceful home. Thank you so much, prophetAvery. When my brain is so scattered, I like to get feedback so that I don't miss anythng. I love your suggestion about lighting the wealthy way candle for him. Im so frustrated with him right now that I wouldn't have even thought of that! Good luck in your hoodooing! I am looking for help with a problem of troublemakers, criminals, and general riff-raff that hang out at the end of our street. We are the last house on the block. Our property is a small farm with pasture space surrounding. The road ends just past our driveway in a large circular cul-de-sac. Closest neighbor is 300 yards away. For the past 10 years this cul-de-sac has been a magnet for all sorts of hooligans, criminals, drug dealers/users who leave their needles and garbage on the street, fornicators who toss used condoms on our property, assholes doing donuts in their cars and then racing up the street etc. I’ve physically chased people away, put up security cameras, called the police, put up neighbor hood watch signs etc. Nothing works, these crappy people keep coming back again and again. I’ve tried doing the Lesser Banishing Ritual of the Pentagram in the cul-de-sac, smudging the cul-de-sac, and blessing the area but the problem remains. I’m not sure what else to do at this point and was hoping for some advice as to how I can keep all these troublemakers away and our property and neighbours safe. I don’t want to banish everyone from this area as there are lots of nice families nearby that walk their dogs and let their children play in the cul-de-sac and ride their bikes which makes me happy. This has me so stressed that every time I hear a noise or car drive by I run to the window to make sure someone isn’t vandalizing our neighbourhood or property. It is making me paranoid and I can’t enjoy our beautiful home and farm when I feel like I am constantly on guard duty. PS. If it is of any use I live in the Pacific Northwest and grow a large selection of organic herbs on the farm (sage, hyssop, rosemary, mullein etc). The cul-de-sac is also flanked by a railroad track so I have access to spent railroad spikes. Welcome to the Lucky Mojo forum! Your home and neighborhood sound lovely except for these awful people, and I'm sorry you're having to deal with this problem. If this were me, I'd get a couple packets of Hot Foot Powder from Lucky Mojo, and use to sprinkle a big circle around the entire cul-de-sac. You don't need to worry about it harming anyone who lives there, because while you sprinkle, you say a prayer like, "May this hot foot powder keep away all drug users, fornicators, drag racers, criminals, hooligans, drug dealers and ALL EVIL PEOPLE away from this place and from this neighborhood." Mix the powder with local dirt so when you sprinkle it around, it's practically invisible. See how that helps, and if you need more help, just let us know. Good luck! Thanks for the response Sister Jean. Just a couple of questions about logistics of using the hotfoot powder outside in such a large area. How long does the effect last? Until it rains and washes it away? To sprinkle a circle around the entire area I would need about 5 pounds of hotfoot powder haha. Could I mix it with large quantity of sand, let the sand absorb the vibrations of the hot foot powder, and then use this diluted mix to make the circle? Finally, the vast majority of troublemakers drive into the area and never actually get out of the vehicles. could I sprinkle a line straight across the road near the entrance to the culdesac to come into contact with their tires? Would that still send them away or do their feet need to come into contact it? Sorry for all the questions, clearly a newbie. You are sprinkling pinches, not creating a solid line, so if you get a couple packets and "water it down" with dirt, I think you'll have plenty. And the effects will last as long as they last, you may need to reapply as soon as you see people coming back--I would just say to stock up on Hot Foot Powder and keep it on hand. Yes I think you could sprinkle a line straight across if you think that would work better, do what you think would work best for the situation. This is very good advice with Hotfoot powder. I've also enjoyed success with annointing small rocks with Hotfoot oil, reciting prayer petitions over them, and leaving the rocks in the miscreant's path or yard. Works with Goofer as well. Hope this helps!